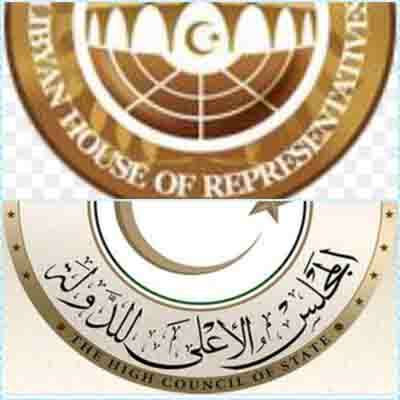 The House of Representatives (HoR) and the High State Council (HSC) will hold two separate sessions next week to discuss the outcome of the talks between HoR head Ageela Saleh and HSC head Khaled Mishri held in the Moroccan capital Rabat at the beginning of this week. According to Mishri, the two entities would hold meetings of their members to discuss what had been agreed in Rabat. Furthermore, Mishri expressed the hope that these efforts would soon culminate in agreement on the required amendments to the Libyan Political Agreement. There has been no confirmation of this from official HoR sources. The official HoR Spokesperson Abdalla Belheeg had announced on Saturday that Saleh would be on an official visit to Morocco on Sunday as a result of an invitation to him from Habib Malki, the head of the Moroccan House of Representatives to discuss the strengthening of bilateral relations between the two countries. He made no mention of the meeting with HSC head Mishri and has made no comment about its outcome either. And although local Libyan social and regular media has been reporting on the outcome of the meeting – no official source has confirmed or denied the contradictory reported news of the results of the meeting. Mishri’s revelation that he and Saleh will report to their respective entities means that they prefer to inform their political bodies of the details first, prior to releasing the news to the general public. This may suggest that some compromise was reached, which would need the approval of the two respective political bodies.